Versatility in Person? Convertibles aim to fuse every advantage of a notebook with that of a pure tablet computer in order to achieve an optimum workflow according to the application field. 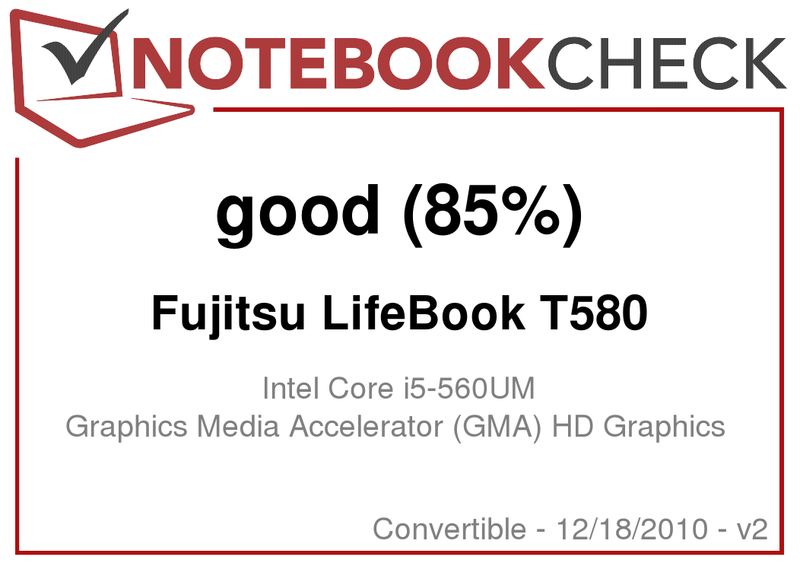 Fujitsu equips its current Lifebook T580 with cutting edge technology and has to prove its potential in the following review. While convertibles have rather had a niche existence until now, agreeably many recent releases back this composition. You currently are spoilt for choice, most likely also enhanced by the tablet boom. 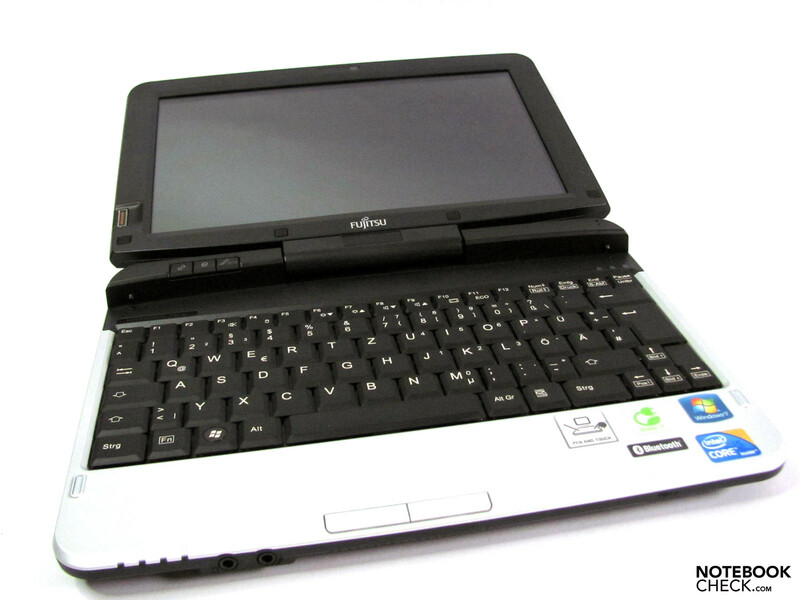 The Fujitsu Lifebook T580 belongs to the business device category (advanced series), but is positioned below competitors like Dell's Latitude XT2, HP's Elitebook 2740p or Lenovo's X201t. 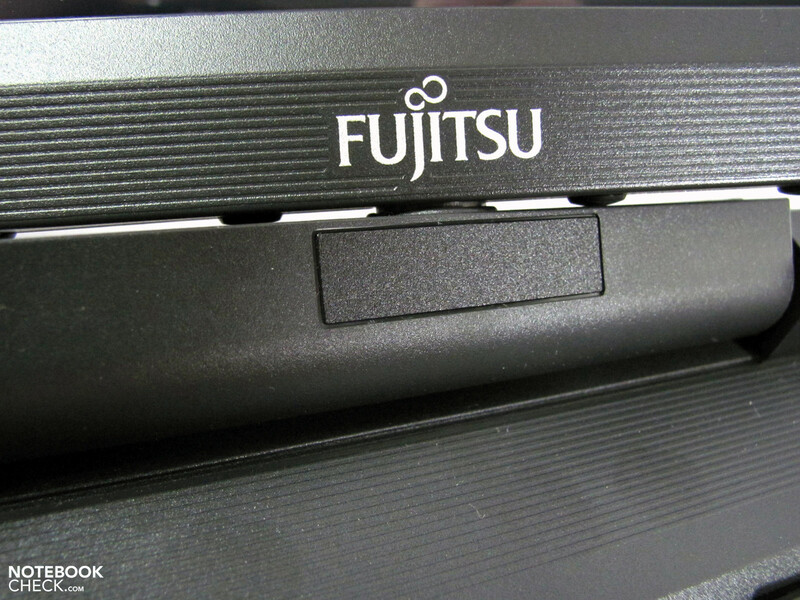 Fujitsu's series thus puts focus on a particularly high mobility factor than pure computing performance. In comparison to established opponents of the 12" range, you can assert a not insignificant weight and size advantage due to the 10" form factor. This could even be a weighty special feature for on the go. 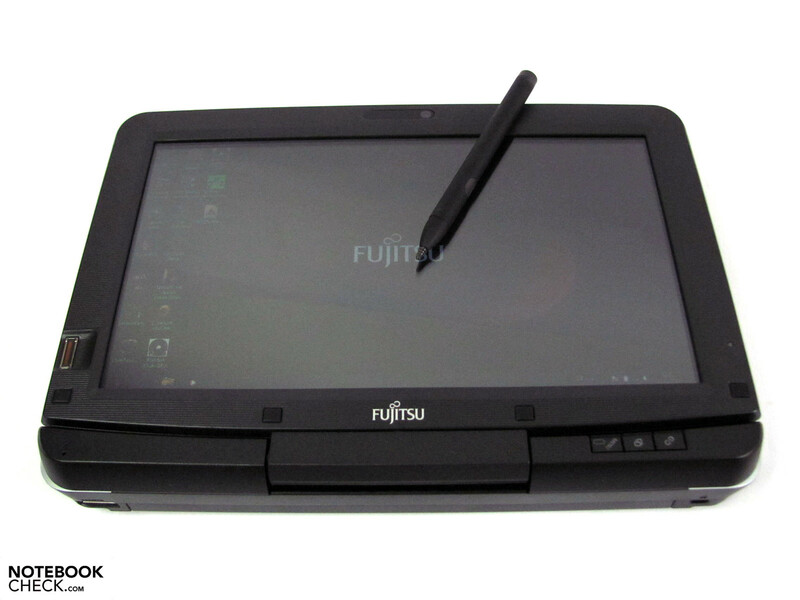 Fujitsu's Advanced Series is otherwise positioned in the center product sector and is supposed to cover mobile office use. Comfortable and efficient working is a crucial factor and thus the main argument for potential buyers. 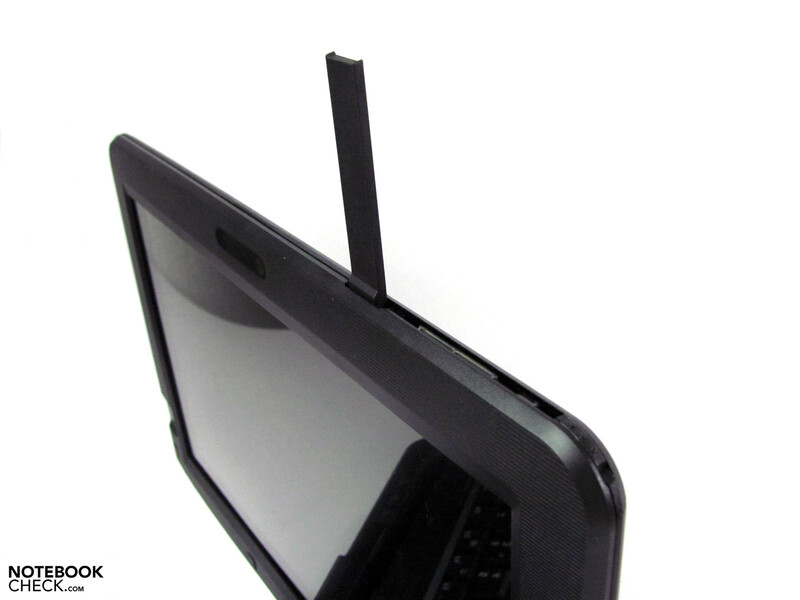 10" display diagonal with WXGA resolution, Ultra Low Voltage CPUs, 1.4 kg weight, UMTS modem and battery runtimes of up to 8 hours are the manufacturer's specs, and which are very impressive. 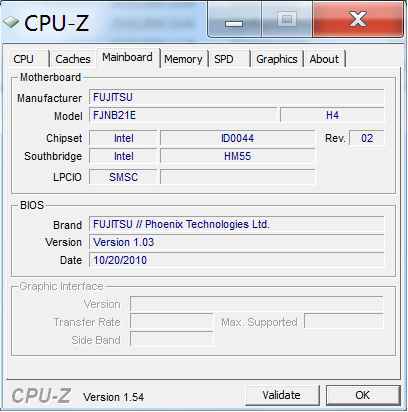 Our test model has an Intel Core i5-560UM CPU with incorporated Intel HD graphics, a 320 GB hard disk, 4 GB of RAM, UMTS and Windows 7 Professional 64 bit. Prices are not yet available. Nor could we find any retailers who list this product. 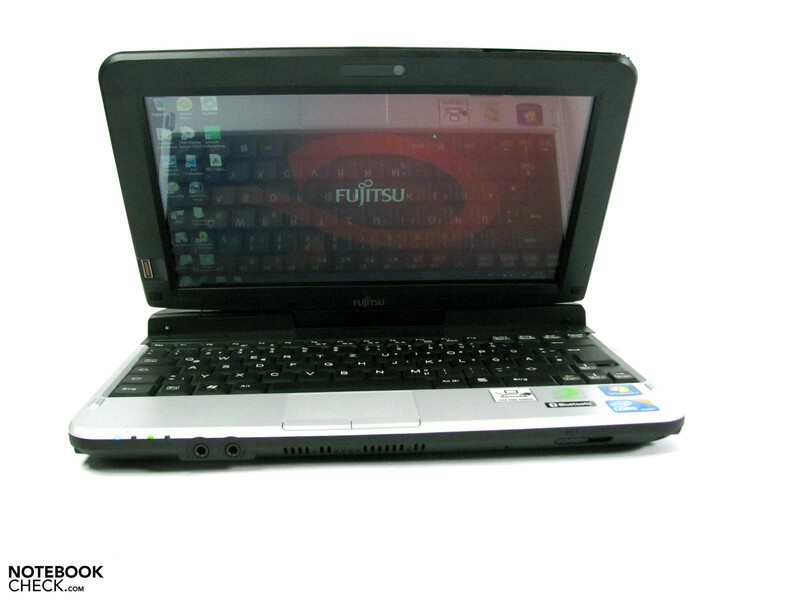 The Fujitsu Lifebook T580's case rather looks like it belongs to the category of wallflowers. It's not especially slim, light or elegant. It rather looks unremittingly conceived for practical reasons. The bicolor case adds a loosened up facade on the one hand, but can't hide a partly cheap-looking material appearance. 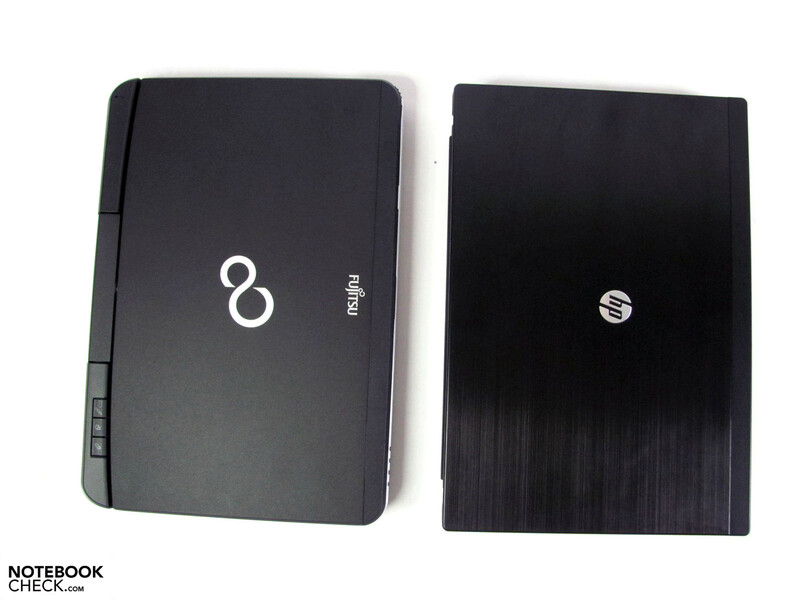 The dimensions of 270x189x40 mm are about on par with other 10" notebooks and the weight of 1.48 kg, including the high capacity 63 Wh battery, is also acceptable. 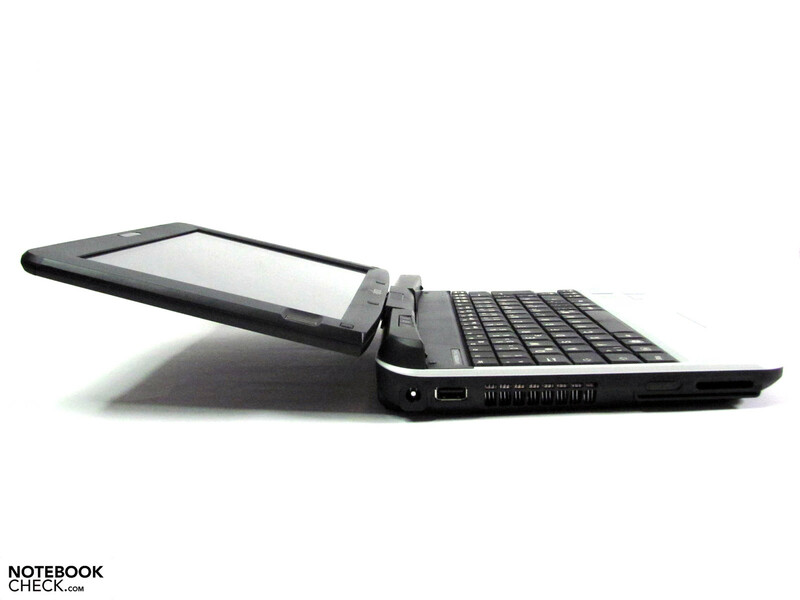 In comparison to the 12" convertible of the competition, such as HP's Elitebook 2740p or Dell's Latitude XT2, there is a certain size and weight advantage. The case stability can be classified as above average. The wrist-rest and other case parts can only be depressed or twisted marginally, if at all. Even the display bezel benefits from the material's thickness. It can only be deformed slightly with high force and countervailing force on the opposite corners. Pressure on the display doesn't provoke any image distortions whatever. 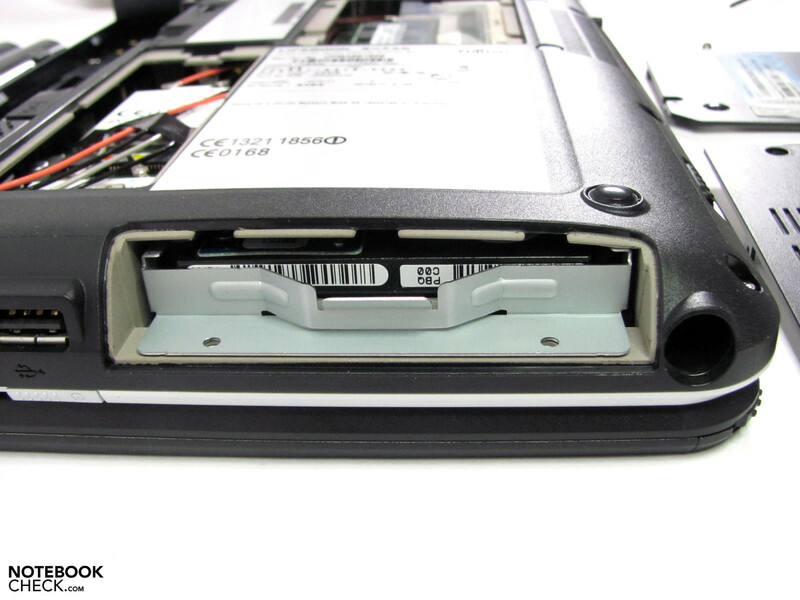 There are several openings on the bottom, which allow access to the most important components. 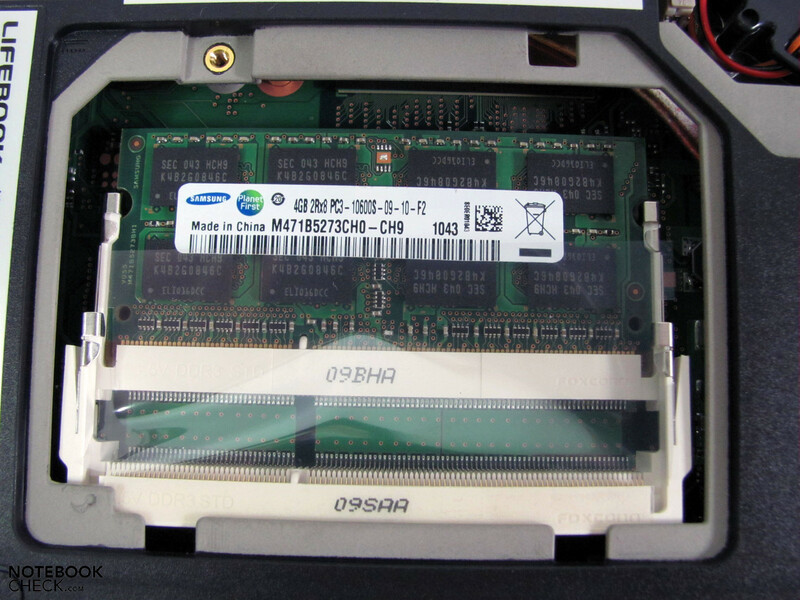 The mass memory, secured with two screws, can be easily pulled out of the case's right and can be replaced if necessary. We have to rate the pivot hinge's stability as not good at all on our test device. It only does its job insufficiently beyond a display angle of 135°. 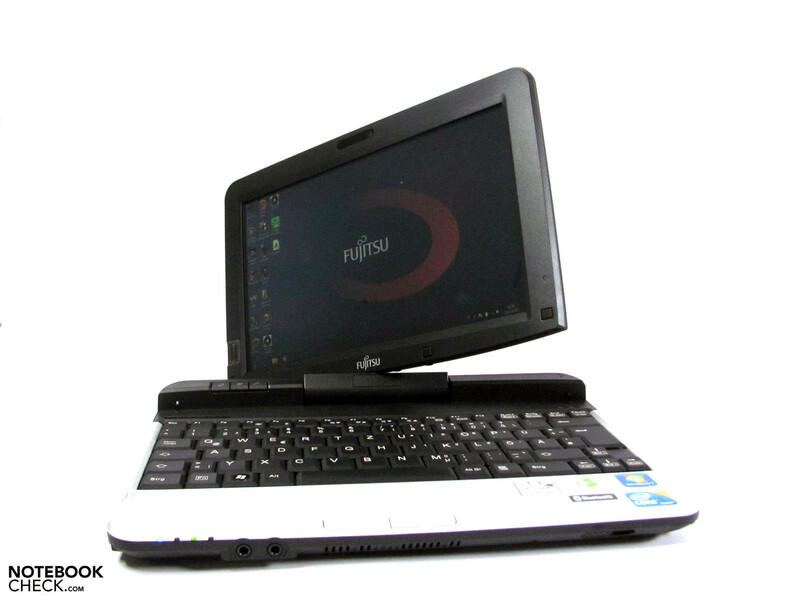 If you want to, for example, carry the Fujitsu from table A to table B, you have to reckon with the display falling back instantaneously – and this in a practically unused test device. We can't say in how far this only applies to the test device, or if it's really a general hinge problem, due to the lack of comparison devices. Too bad, because the pivot hinge makes a good impression otherwise. 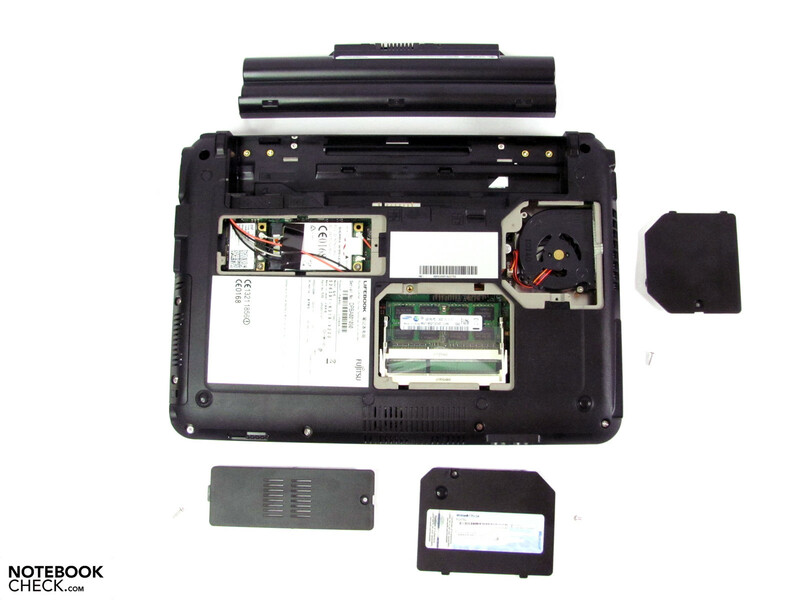 We couldn't determine elbowroom as in HP's Elitebook 2740p. The display is unremittingly aligned for the business customer field and strikes with a few features. 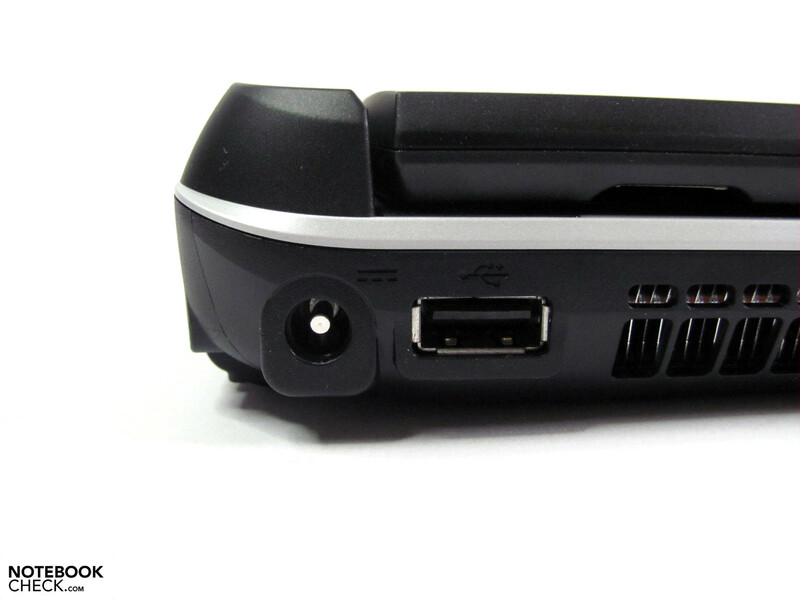 Smartcard slot, fingerprint reader, Trusted Platform module 1.2, brightness sensor and UMTS module including GPS are features that are appreciated in every company with fieldwork or varying fields of activity. There are two USB 2.0 ports available, but this could quickly be too little, especially in stationary use depending on peripheral utilization without a port replicator. Beyond that, cutting edge ports, like eSATA or USB 3.0 that would be preferred for connecting fast external hard disks or memory sticks. They supply considerably higher transfer rates than the 26.6 MB/s (read) that we determined at both USB 2.0 ports. 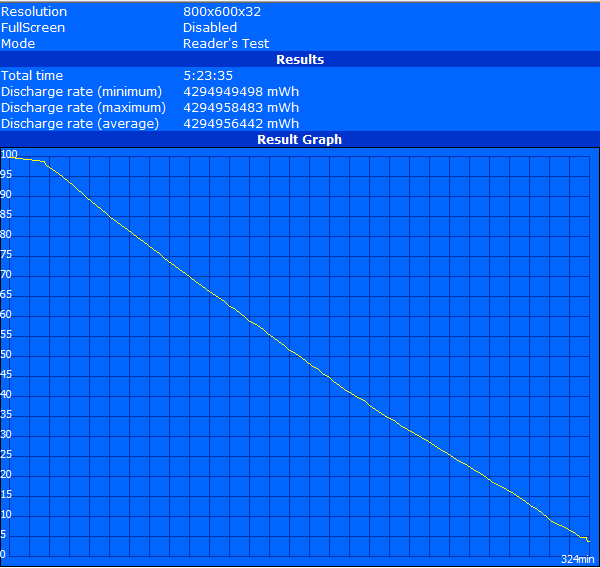 In return, the cardreader supplied a good maximum result of 20.9 MB/s (read). Then again, the available HDMI monitor out which amiably complements the standardly existing analog VGA port is very pleasing. Aside from transmitting sound simultaneously, a much superior video quality can be observed especially in higher resolutions (both theoretically up to 1920x1200 possible). Images appear slightly unfocused on the external monitor via analog VGA starting at 1680x1050 pixels. However, you receive a good and sharp picture with 1280x1024 pixels that even allows longer working without restrictions. 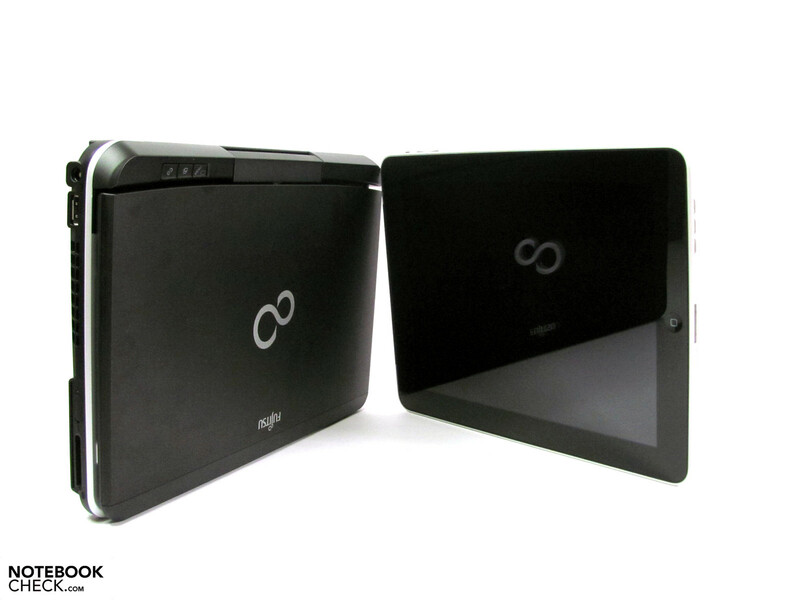 The convertible brings along the standard interfaces features, such as Gigabit LAN, Bluetooth, WLAN 802.11n and audio in/out. 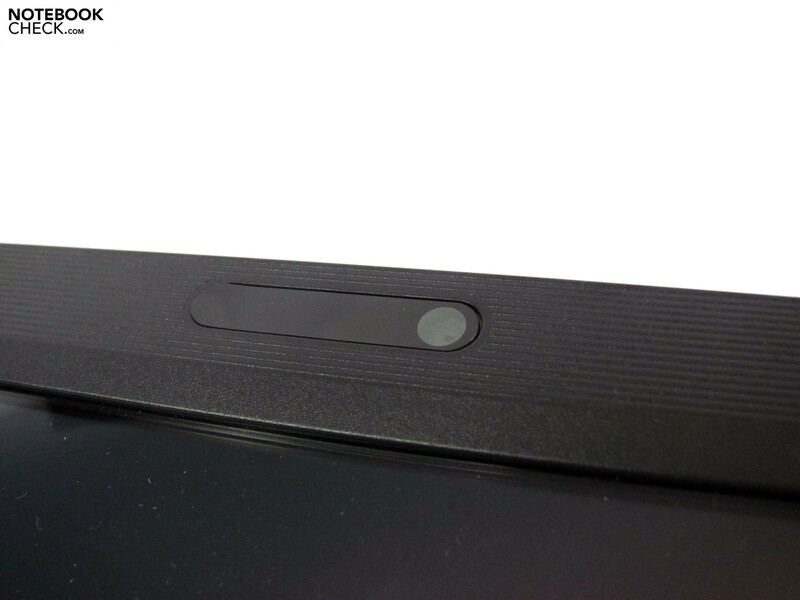 The webcam, built into the display bezel, supplies 1.3 MP and the digitizer pen can be inserted into the case's side. In our opinion, the port distribution has been almost perfectly solved. You won't have to accept restrictions caused by peripherals connected as far back as possible. Nevertheless, the card reader, audio sockets and hardware slider are easily accessible. That's great. A cover and a Windows 7 Professional 32bit and 64bit recovery DVD are included. The supply assortment is rather clear and is basically limited to a USB replicator that can also be used with other model ranges. There is a 24 month warranty and can be extended up to 5 year bring-in or onsite service with so-called service packs. The prices start at 40 euro, but can even reach 355 euro if required. The keyboard has been executed overall firmly and only a hardly audible clattering and yielding can be evoked on the left edge. 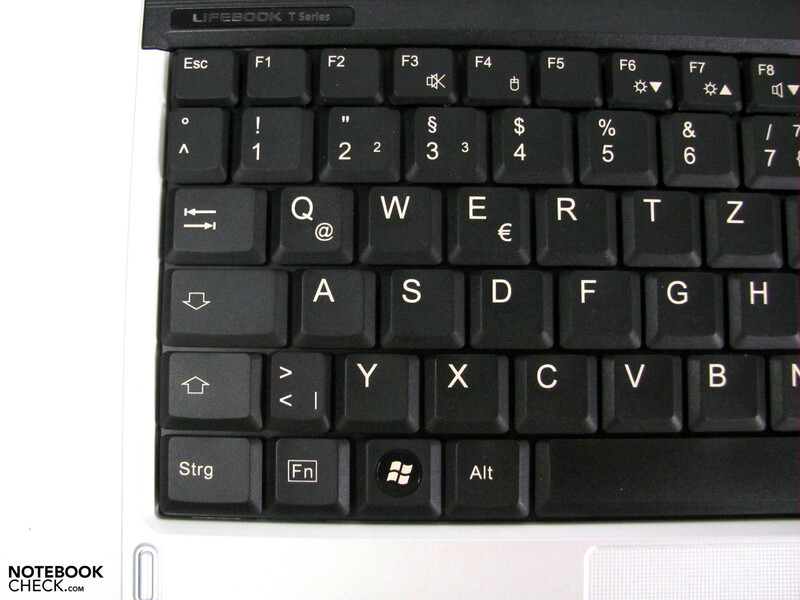 Otherwise, the keyboard sits very tight and supplies a pleasant feedback. The keys are made in a 17.5 mm grid, but can be used confidently after a short accommodation period due to the standard layout. The medium short stroke length is accompanied by a clear pressure point and the triggering noise is never obtrusive. The high contrast lettering allows a long period of recognition even in dark ambient lighting. However, there is no keyboard illumination. 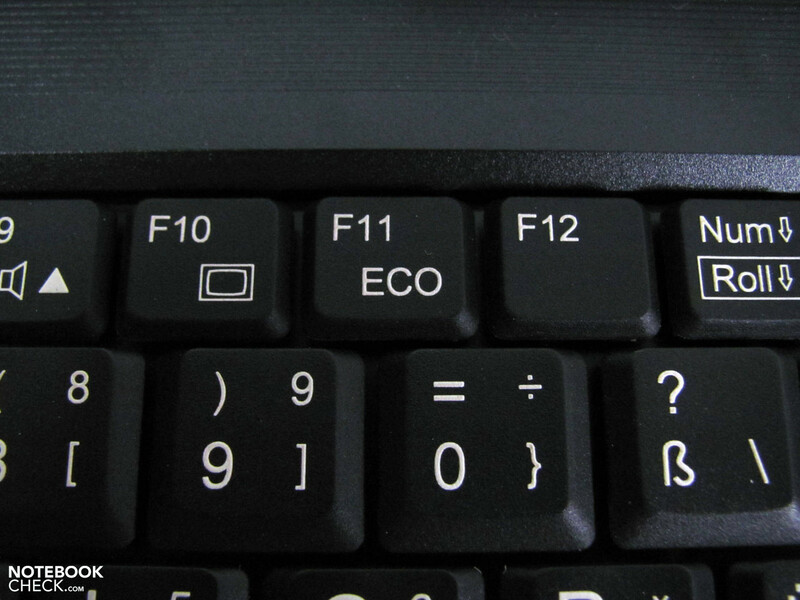 A standard number of hot keys has been implemented and can be accessed via FN combinations. 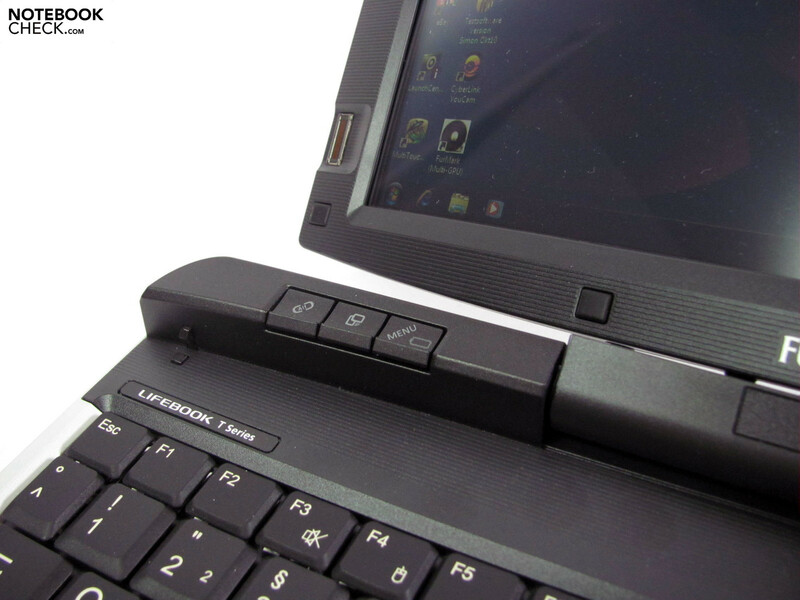 There are hot keys relevant for tablet mode integrated into the bulge. 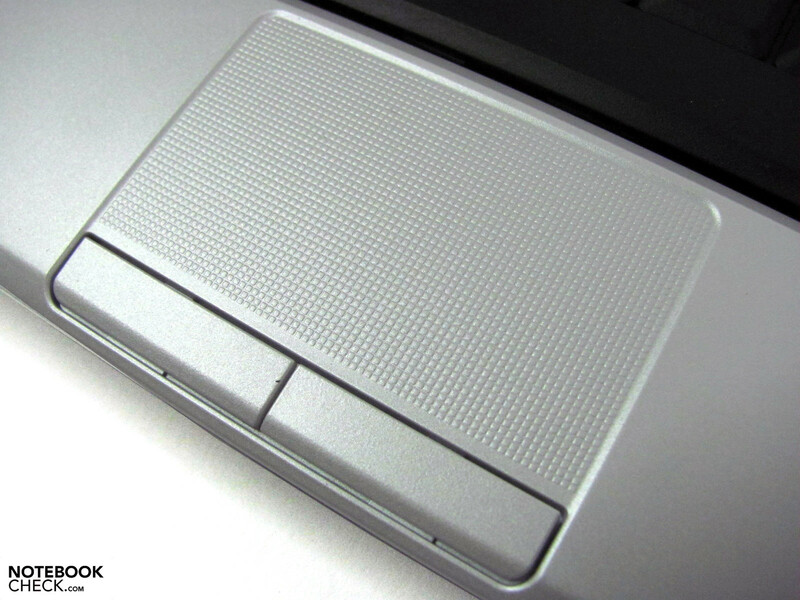 The touchpad is fairly small, but responds well. 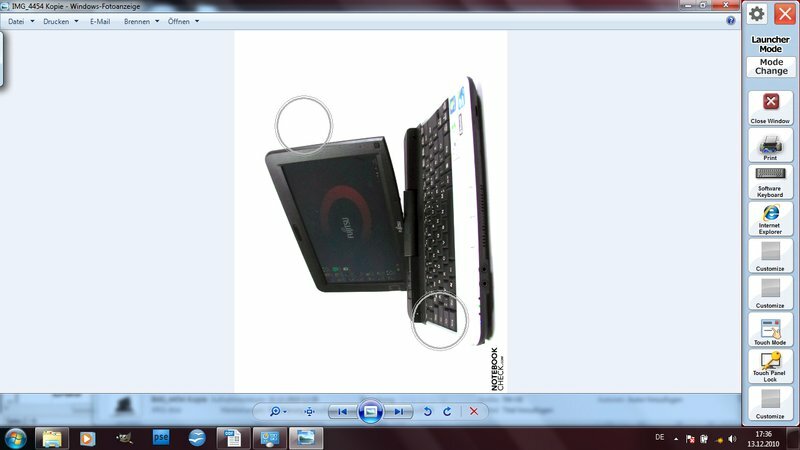 It also has pleasant haptics due to the ribbed surface. 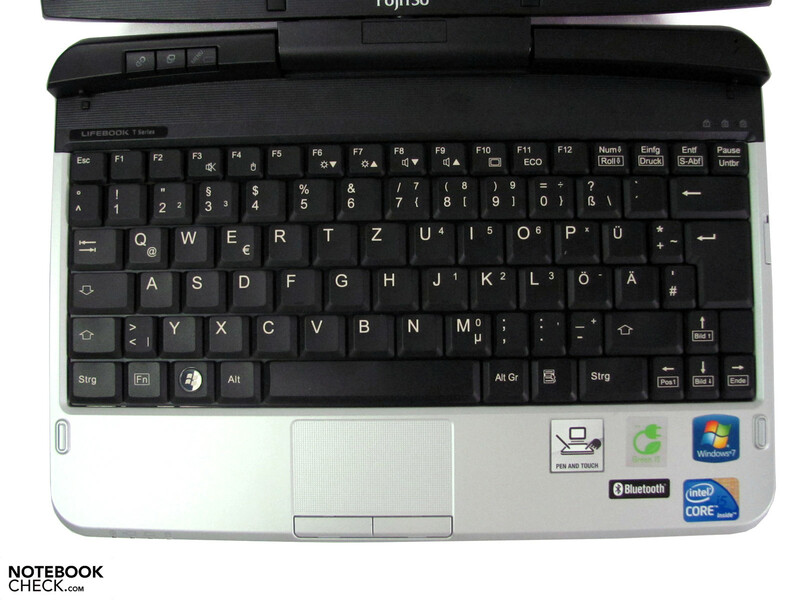 The touchpad keys work smoothly and also respond well. If desired, it can be disabled. 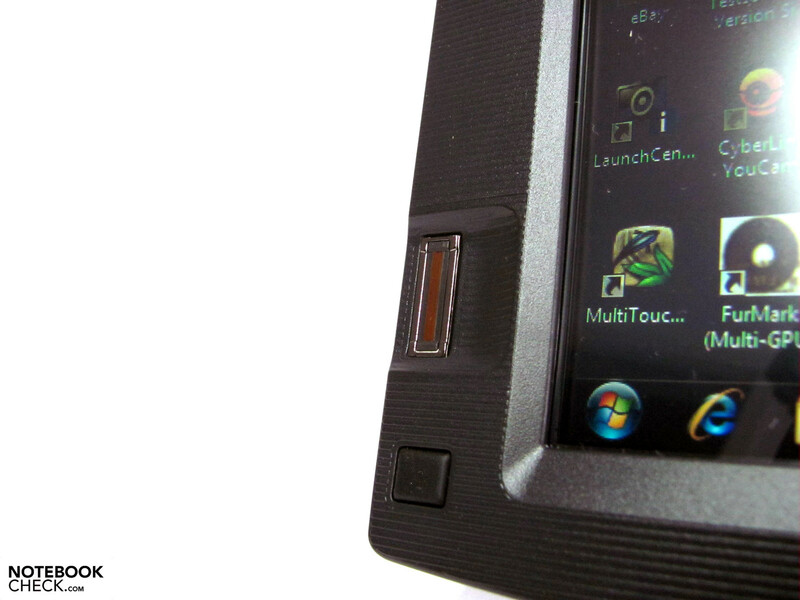 The display provides the option of inputting via digitizer or capacitive (via 4 finger multi-touch). 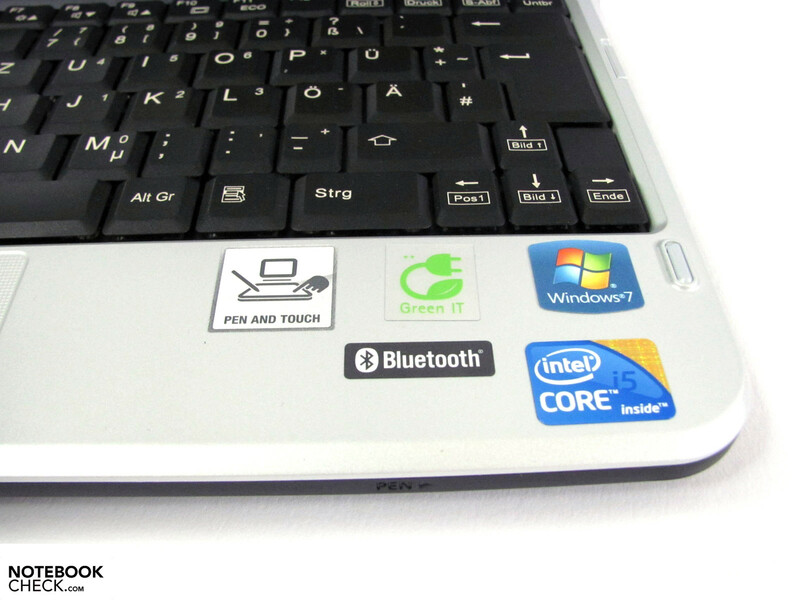 Microsoft's Touch Pack for Windows 7, an Auto Rotation Utility, a pen calibration tool and a utility tool for the tablet buttons is included as tablet specific software. What is ultimately seen as useful or not will be a rather personal decision. In any case, it makes sense to execute a screen calibration before the first intensive use. Pen and fingers can be calibrated separately. The Ntrig surface has a very high accuracy. 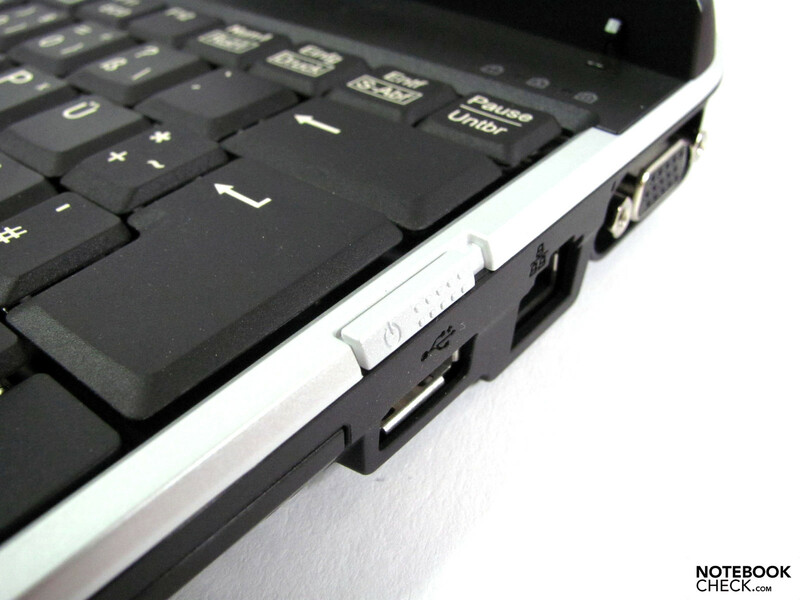 We couldn't even determine deviations of up to 2 mm in the edge areas, like in HP's Elitebook 2740p. 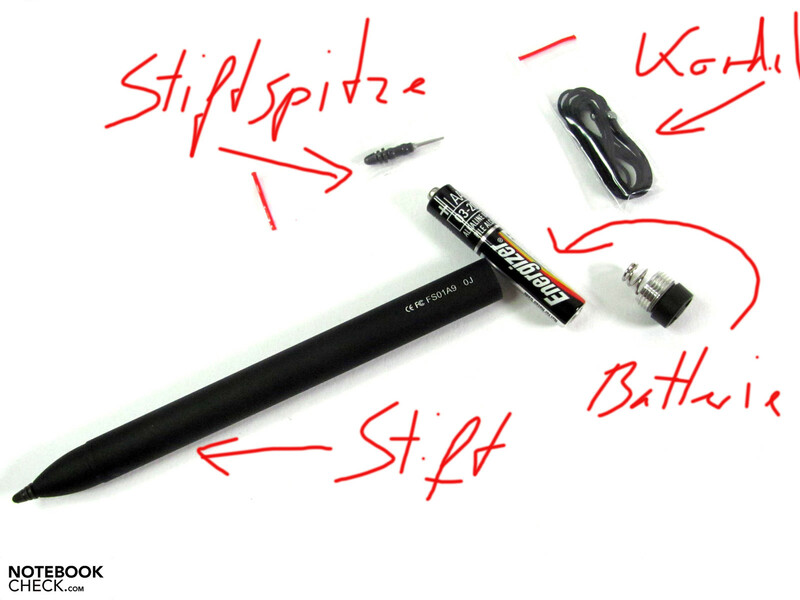 The active pen is battery-powered. It feels comfortable when held and can thus be used even for a longer time. Pen input is to be especially preferred for precision tasks due to the high accuracy of the pen's point. Writing, drawing, etc. is quite easy after a bit of practice. Window 7's signature recognition is adaptive and can be used with Open Office and MS Office. It deals quite well with the respective individual handwriting habits after a bit of use. Nevertheless, handwriting is rather awkward and will usually be limited to short notes in practical use. Finger inputs suffer a bit under the high resolution. Buttons, menus and control panels are often simply too small for the big fingertips. 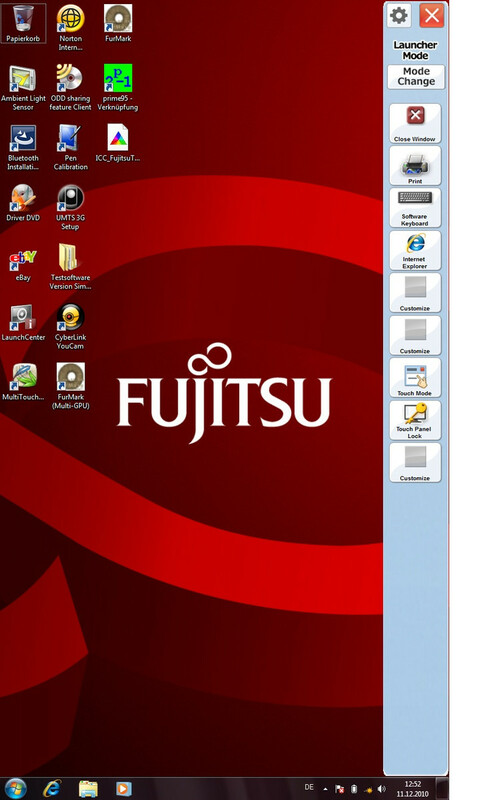 Although Fujitsu has provided some improvement with adapted (larger) icons, you often find too small control fields that occasionally cause typos due to the thick fingers. The size customization possibility for documents and symbols provided in the system works more effectively here. It allows more pleasant working with a magnification of 125%. Files, folders, etc. can then be easily moved or edited. Multi-touch gestures can be used analog with the touchpad and allow the standard use of zoom, rotate, scroll direct on the screen. Although this works quite well for Windows conditions, it's still remote from the smoothness and simplicity of an Apple iPad. The latter can provide an operating system unremittingly developed for finger use with iOS. The alternative input methods can't keep up with the specialists of the single guild, but complement mouse and touchpad in certain application situations well, and provide for a faster workflow. 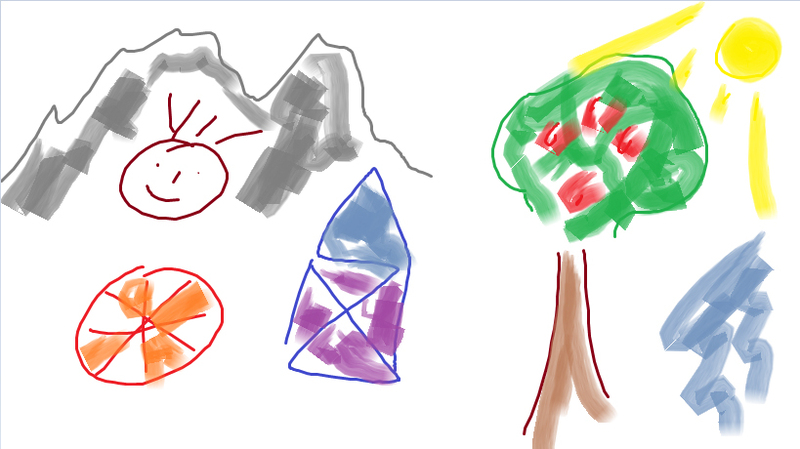 Sketches, notes and comments can be created fast and easy with the pen. Presentations can be comfortably made with fingers. Pictures are rotated in a wink of an eye. One or even several work steps can be saved in many fields and even come close to being fun. 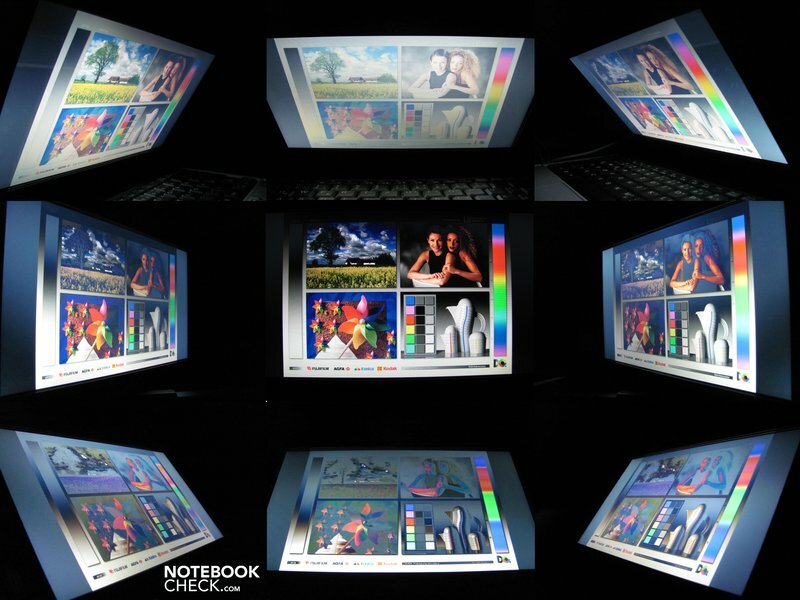 The Lifebook T580's 10.1" display has a resolution of 1366x768 pixels in a 16:9 aspect ratio. This is very unusual since there are hardly any devices that have this combination, excepting for HP's Mini and Dell's Mini. In comparison, Apple's iPad uses 1024x768 and the 12" opponents from Dell, HP and Lenovo 1280x800 pixels. The dot density is 156 dpi and the size of symbols, documents, icons, etc. may be too small for some users. However, this can be remedied quite well via the according system control settings and the linked advantage of a much larger desktop surface won't want to be forgone on after a while of use. Thus, this combination can overall be seen as an appreciated quality enhancement. 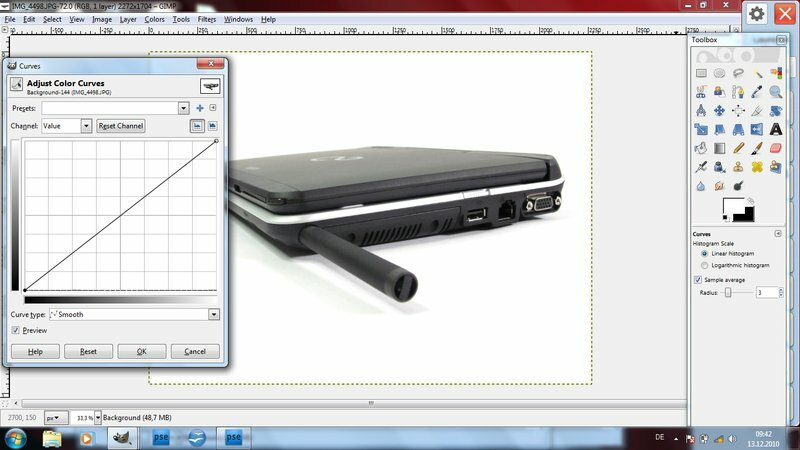 We've edited all product pictures of this test device on the Lifebook T580 and managed quite well with the resolution. We disliked the glossy display surface. Subjectively, the image looks a bit sharper than on roughened screens. Nevertheless, the drawback of having to live with mirrored images of the surroundings clearly dominates. The actual displayed content is pushed into the background, depending on the situation, and working is even more strenuous. The darker the content and brighter the surroundings, the more prominent this effect gets. You'll find yourself wishing for an even brighter display illumination in brightly lit rooms because the displayed content will seem to be too dark. Users should avoid light-colored cloths and light sources aimed directly at the screen when possible, anyway. The manufacturer states a brightness of 200 cd/m2. We determined brightness rates of 175 cd/m2 up to 199 cd/m2. This results in an average brightness of 191 cd/m2 and is thus a bit below the manufacturer's promise. The light sensor is supposed to adjust the display brightness according to the ambient light situation automatically. In our opinion, it reacts a bit slow and not always as required. If it doesn't work according to your taste, it can be disabled and the settings can be made manually, as usual. The outdoor suitability is very limited due to the reflective display surface and the too low brightness. Work is only possible in shady places, whereas the mentioned reflections partly irritate greatly. At least, the full display brightness is also available in battery mode. The color spectrum is within the known standard notebook display range and covers 57% of the sRGB color space. The contrast ratio also at best achieves the mentioned level of competitor models. However, this is usually not as important for a business device. On the other hand, the possible viewing angles are of major importance for a tablet – and in our case, almost a disaster. You may only await the standard notebook fare, which quickly inverts or produces color bleaching on the vertical plane. Logically, you have to struggle with the right and left edge in the upright format. In return, the horizontal viewing angle stability is still acceptable. 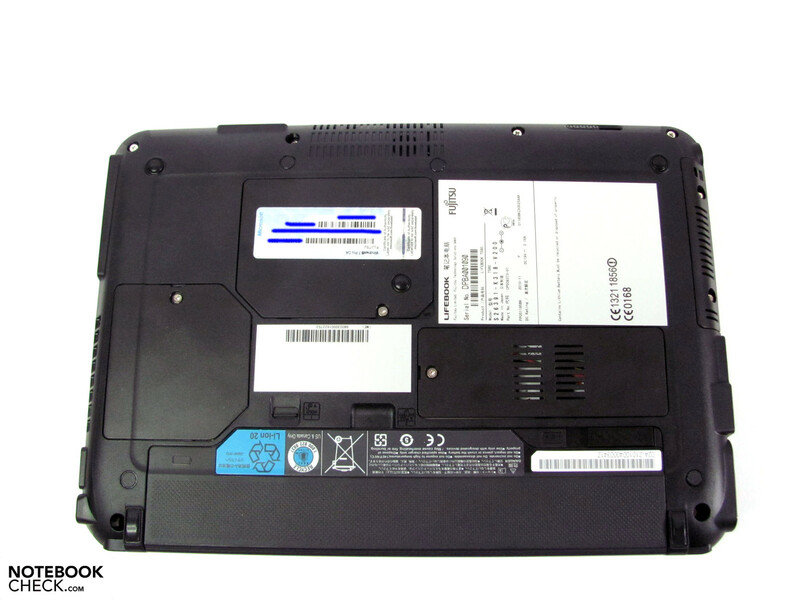 Nevertheless, it can't reach the quality of an HP Elitebook 2740p. The iPad scores even better on total. It doesn't allow as many color deviations to become visible besides having large viewing angles. 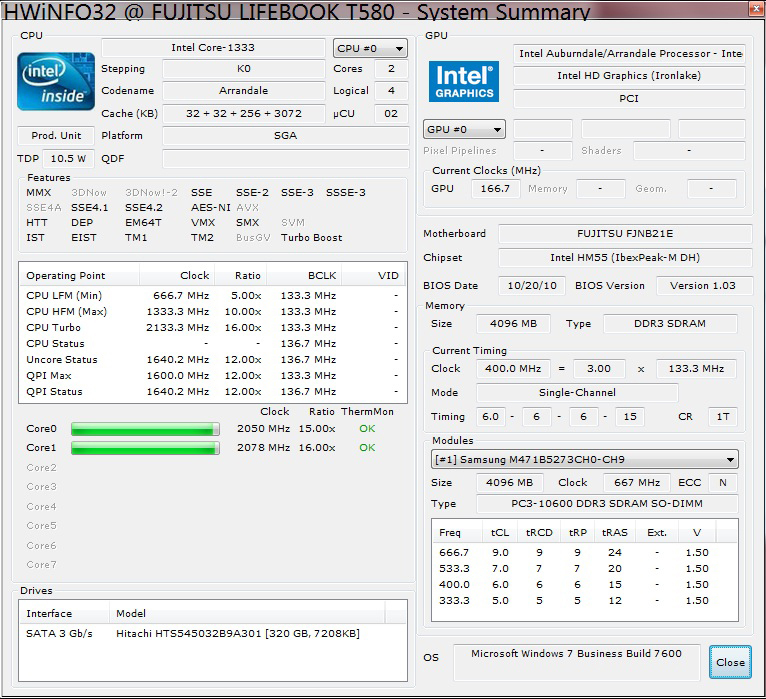 Fujitsu's Lifebook T580 comes with until hardly found Intel ULV CPUs. The Core i5-560 UM processor works with a base clock rate of 1.33 GHz, which can be increased up to 2.13 GHz in single thread applications with Turbo Boost. Other features include a 3 MB cache, Hyperthreading (4 threads simultaneously, maximum) and the economic TDP of 18 watts including the memory controller and Intel HD graphics. The latter can adapt its rate of 166 MHz up to 500 MHz dynamically. 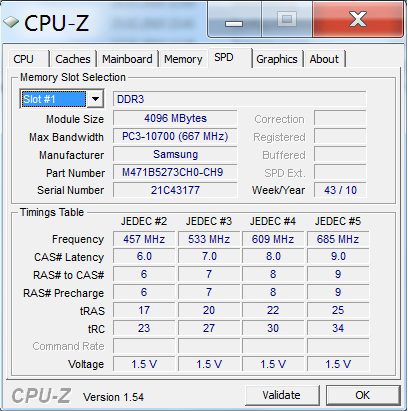 A highlight of our test system is the unoccupied second RAM bay, as it is equipped with a 4 GB DDR3 RAM module. 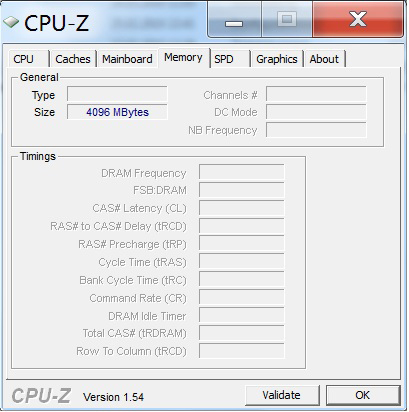 Thus, the maximum possible of 8 GB RAM can be quickly implemented with an additional module. 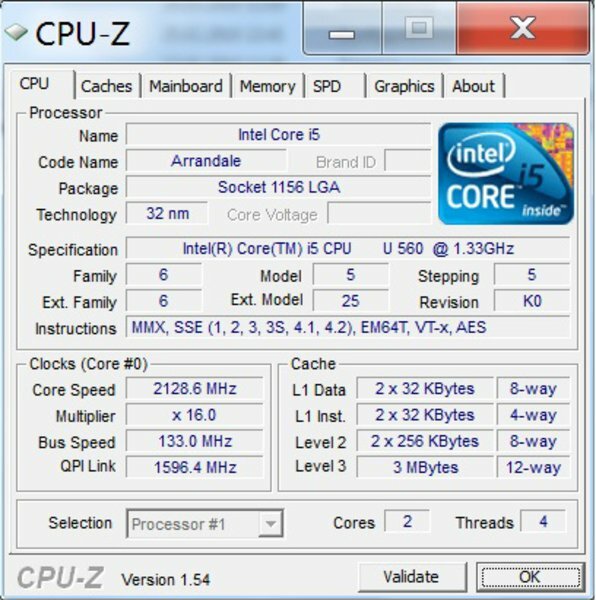 The CPU benchmark results are very agreeable due to cutting edge technology, and verify the system's good performance. For example, 2743 (single) and 5684 (multi) points are achieved in Cinebench R10 64bit and calculating wPrime 1024m is finished in 1965 seconds. 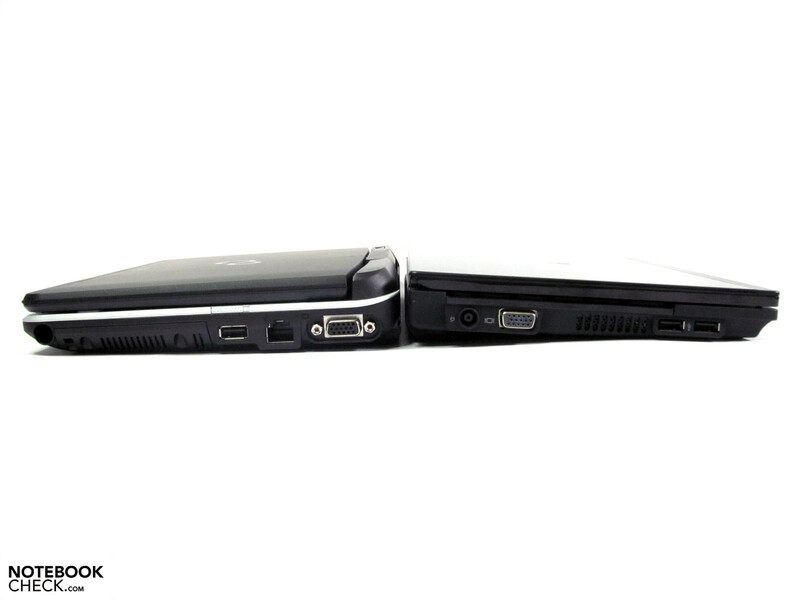 The Lifebook T580 isn't very viable for gaming or graphically heavy 3D tasks. 1270 points are achieved in Cinebench R10 OpenGL Shading and 1010 points in 3DMark06. 3DMark Vantage didn't even run through. 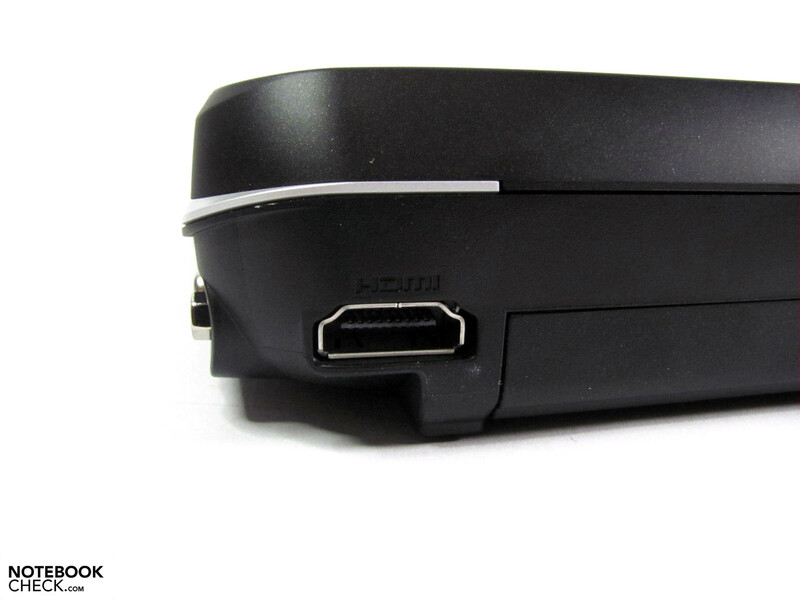 Our FullHD test videos were rendered smoothly as expected and thus make the test device to a potential video player. 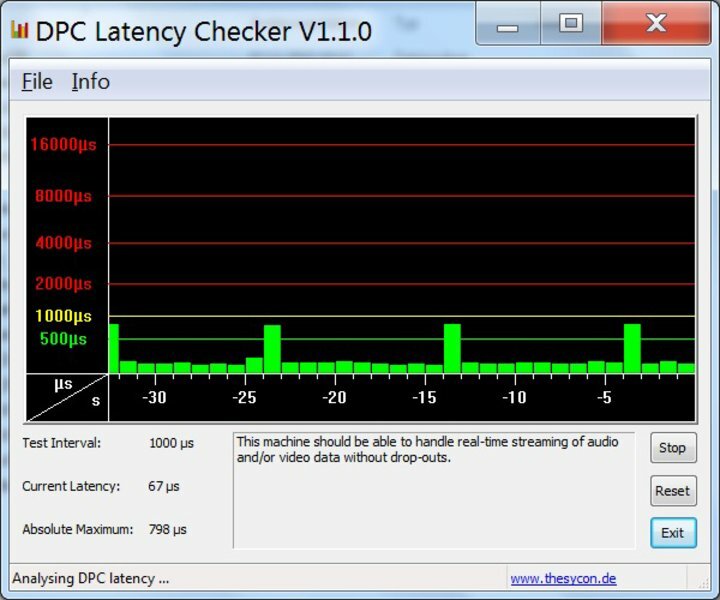 DPC Latency Checker supplies an exemplary result in view of possible latencies. There aren't any problems to be expected with externally connected peripherals. 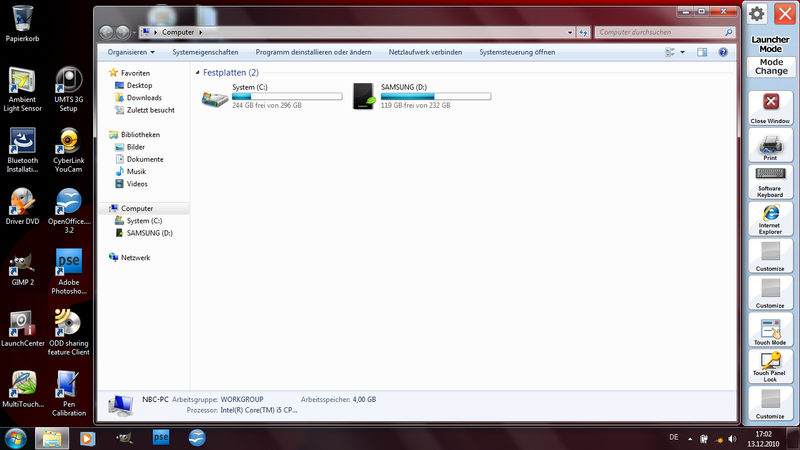 The system doesn't have any problems with 56 pictures á 2 MB in Gimp or Photoshop Elements 7 simultaneously opened. You have to reckon with a tenth of a second while clicking through every picture, but gets faster with each one that is stored after editing. At the same time, you can have Office and Photoshop opened and smoothly switch back and forth. We converted MP3 songs with a 23.8-fold speed from MP3 to AAC format with iTunes. PCMark Vantage's achieved score of 4626 points also verify a good application performance, which is more than sufficient for most standard tasks. The Hitachi hard disk rotates with 5400 rpm and has a capacity of 320 GB. The drive achieves average transfer rates of just below 65 MB/s and thus complies with the current standard performance. Alternatively, the use of an SSD could increase the system's speed considerably. Aside from the higher transfer rates, especially the significantly shorter access rates of less than 1 ms in comparison to the hard disk's 19 ms would result in a noticeable effect for routine use. 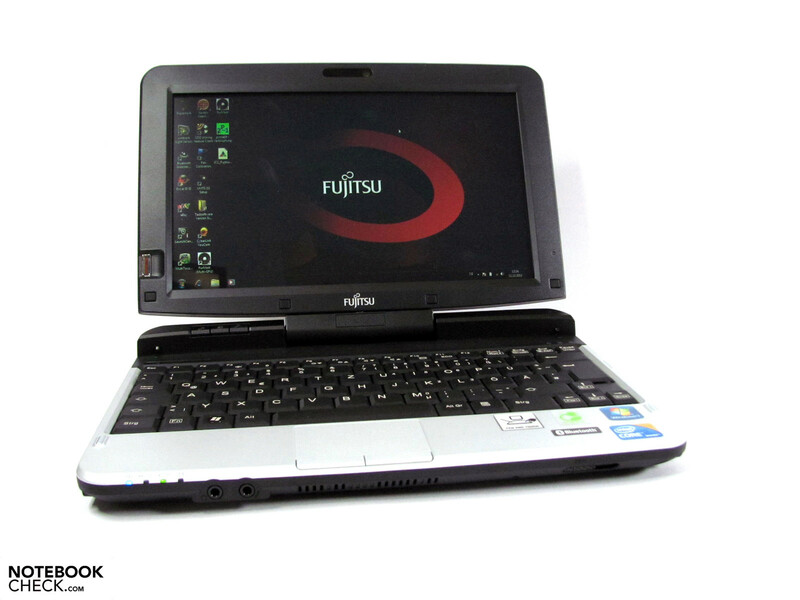 Even if not silent, the Fujitsu notebook works mostly quiet. The fan's characteristic is very modest and even. Thus, you usually have to reckon with 31.5 dB(A) up to 33.5 dB(A). The fan activity doesn't decrease in ECO Mode, in comparison to Window's default energy savings profile, despite the lower power consumption. The device's noise increases to a still moderate 34.4 dB(A) under medium load, which can reach a peak of up to 38.4 dB(A). The temperature development is very restrained in both load and energy savings mode. The fact that partly lower surface temperatures can be determined under load than under low load, point toward generous reserves. The measured maximum of 36.2°C are far from a critical area and don't indicate any restrictions. (+) The maximum temperature on the upper side is 34.1 °C / 93 F, compared to the average of 35.4 °C / 96 F, ranging from 21.8 to 55.7 °C for the class Convertible. The mono speaker installed in the case has only one output channel, aside the usual drawbacks found in this device category. That would be enhanced high pitches and missing basses. It's sufficient for system sounds or background music. However, external boxes or headphones should be used for more. The prerequisites for a long battery life are almost perfect. 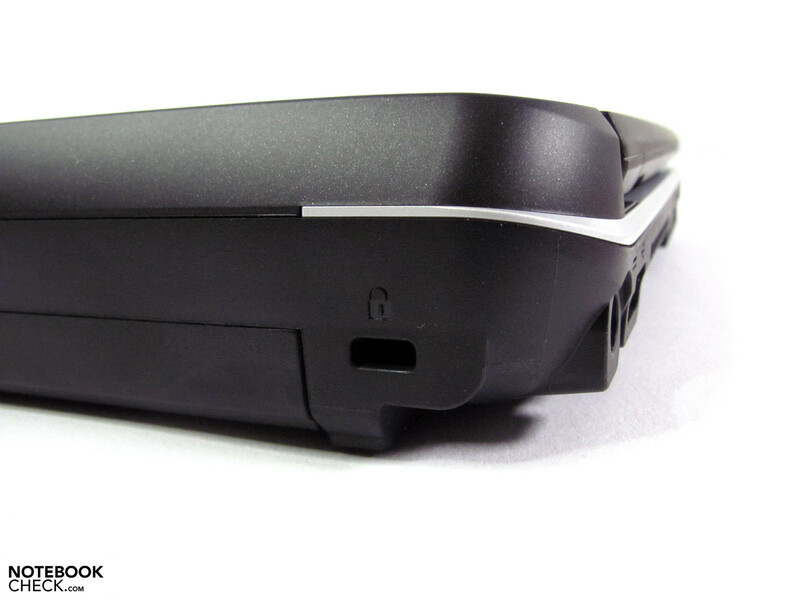 Energy saving components, a small display and a high capacity battery of 63 Wh boost expectations. Nevertheless, the power consumption rates measured at the mains are sobering. It is higher than some competitors with a minimum of 12.9 watts. The HP 2740p, for example, has less than 10 watts, despite a Core i5-540M CPU and basically the same configuration otherwise. The Lifebook first approaches this limit in ECO Mode with 10.1 watts. This result is paid for with disabled components, such as WLAN, cardreader, audio and Bluetooth. The power consumption increases to 14.6 watts up to 17.9 watts under low load, depending on the energy savings profile. The processor's high base clock and amplified display brightness are particularly responsible for increasing power consumption. Finally, the CPU's and GPU's requirement take their toll and consume 21 up to 35 watts of power. We range in a rather average field in terms of battery life. We achieve the longest battery life with BatteryEater's Reader's Test (maximum possible runtime, minimum display brightness) in ECO mode, which is 397 minutes. We are still remote from the promised 8 hour battery life by an hour, despite the above mentioned restrictions. 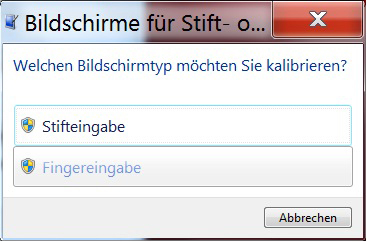 This runtime even decreases to 324 min in Window's default energy saving setting and to 251 min during WLAN activity and adjusted display brightness. 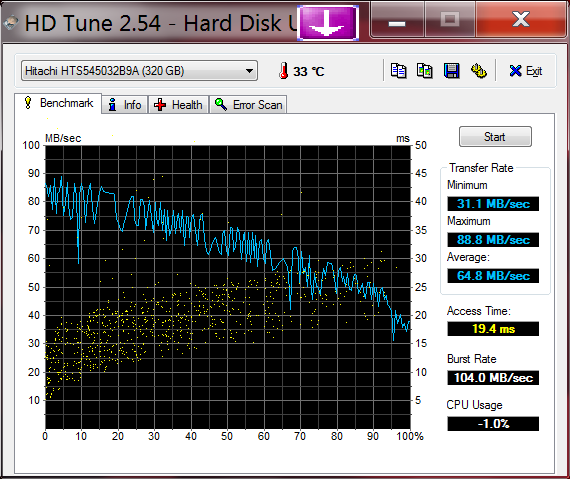 Watching videos from the hard disk (full brightness) was possible for 164 min. Under full load, by means of BatteryEater's Classic Test (minimum possible battery runtime, all consumers on, maximum display brightness) let the battery life shrink to exactly 120 min. The battery had a capacity rest of 3% in all results. 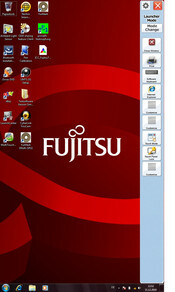 Fujitsu has, as in the Celsius H700, set up an overall interesting device. Focus was especially placed on inner values and visual refinements were neglected. The case is solid, easy to clean and appropriately designed for the target group, with exception of the material's appearance. This unfortunately just doesn't apply to the display hinge, which already caves in under the display's weight during slight movements. The display, with the reflective surface and poor viewing angle stability, isn't very suitable for a convertible notebook either. Additionally, outdoor use is only possible with restrictions. We liked the other mobility qualities, such as low weight, still acceptable battery life and overall good equipment. If USB 3.0 or eSATA had been added, this point would have been perfect in view of the successful interface distribution. You are recompensed a bit with a digital monitor out and important business features which isn't always a matter of course. 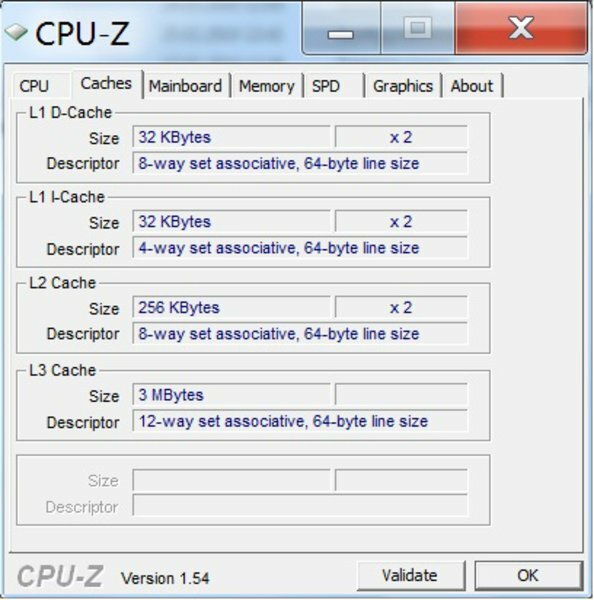 The system performance is good and the RAM configuration is exemplary in regards to upgradability. The main reason for purchasing this device will especially be the option of inputting via a pen or fingers directly on the screen. It represents a good supplement to the usual inputting methods. Hidden on/off button on the case's right. 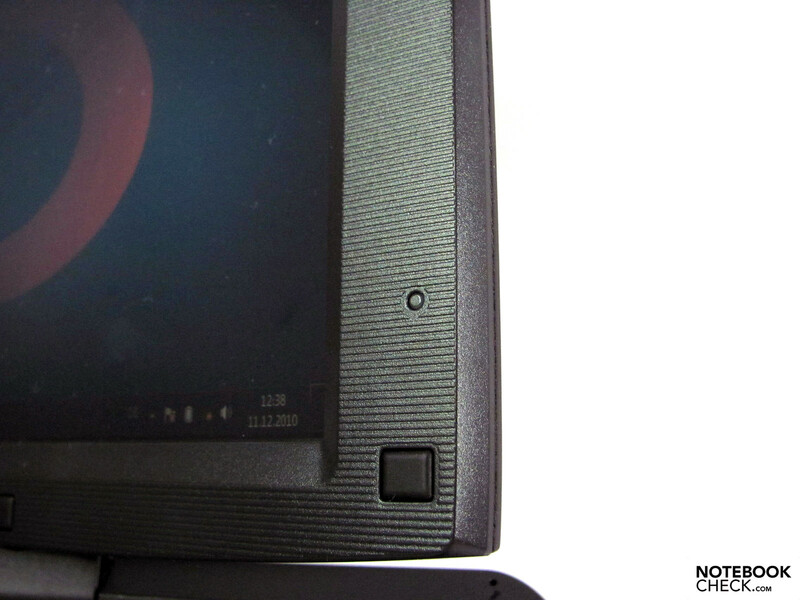 The microphone isn't installed in the display bezel, but rather in the case bulge. …which also applies to the Kensington preparation. Even the other connections are satisfying with a suitable placement far in the back. 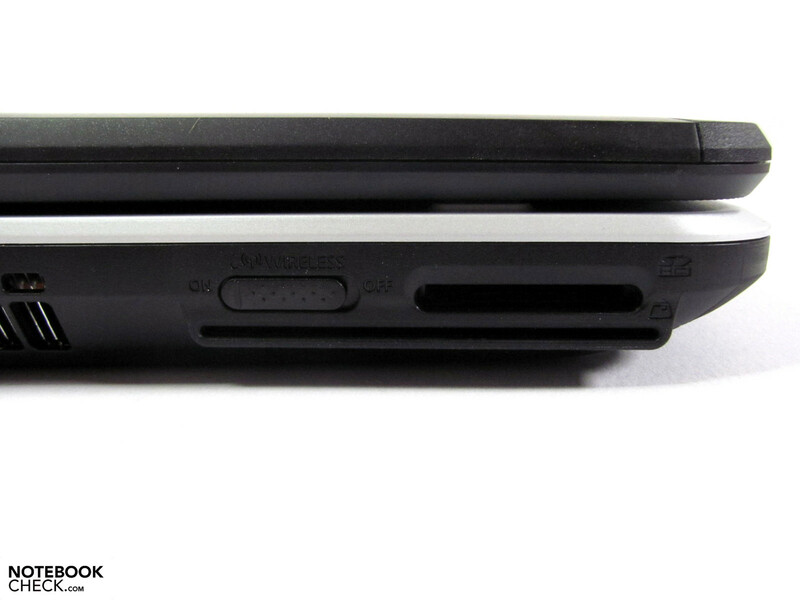 Card slots and hardware sliders are installed easy to access on the front. Many components can be accessed via the bottom tray. 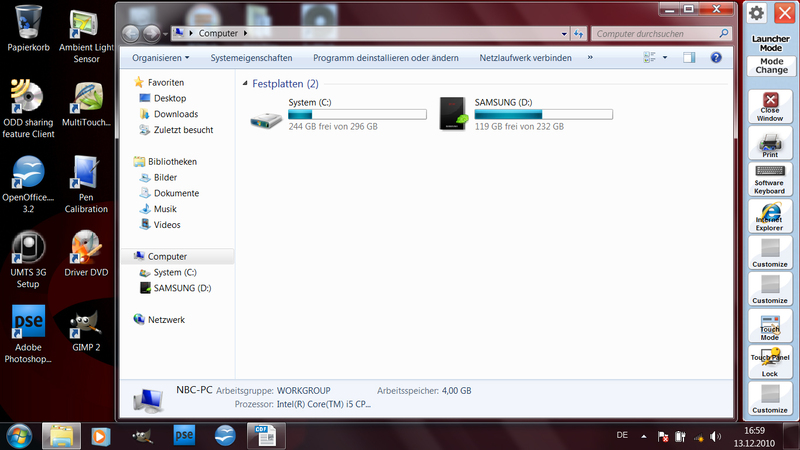 Very good: 4 GB module + free RAM slot. Gobi 2000 UMTS is already installed. Very good: Hard disk can be exchanged from the side. The high capacity adapter just still provides good runtimes. 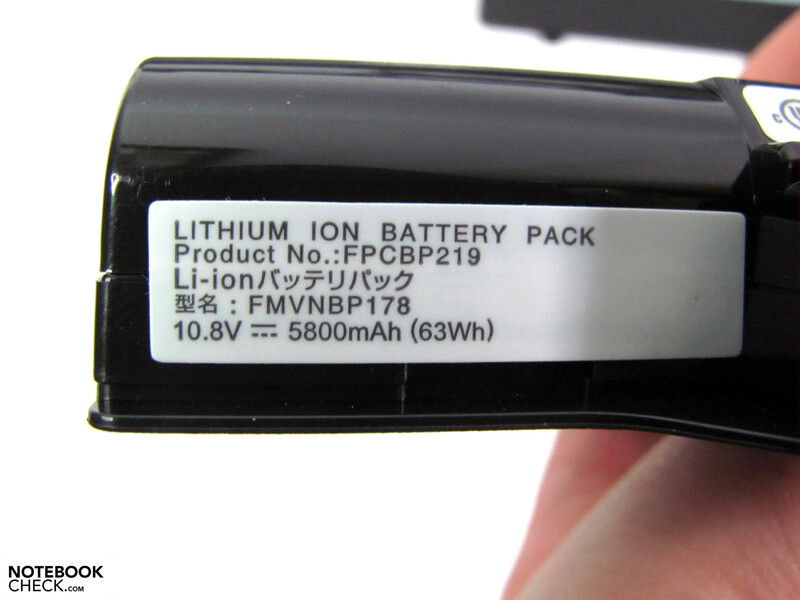 The economic components can't provide the expected battery life. 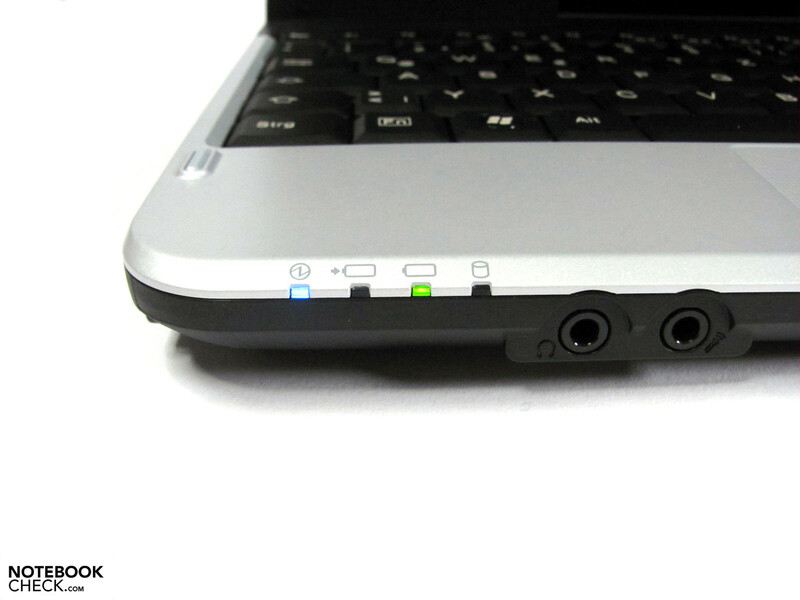 Audio port on the front will especially please headphone users. Brightness sensor in the display bezel's right. Pen and finger inputs are well conceived in regards to hardware. …rather inconspicuous due to material appearance and design. Big advantage: Weight and size are very portable. 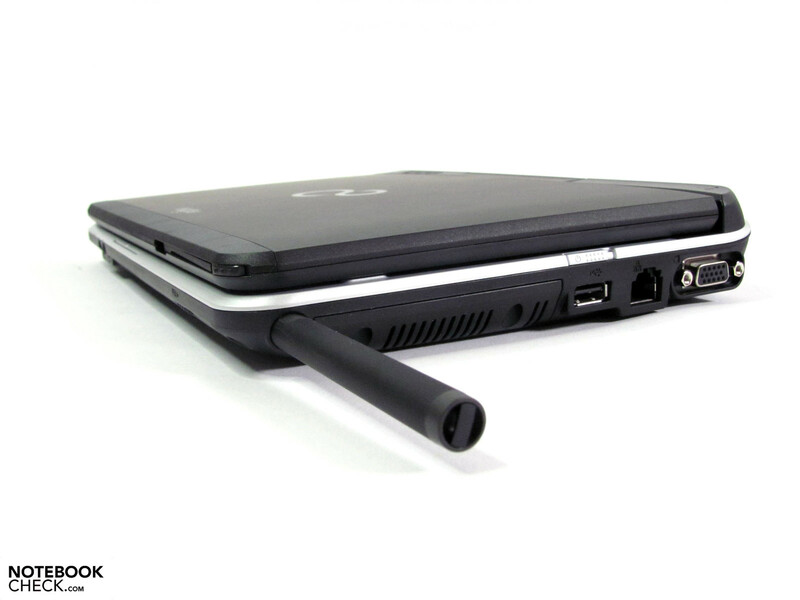 As already in HP's 2740p, an antenna is supposed to provide better reception. 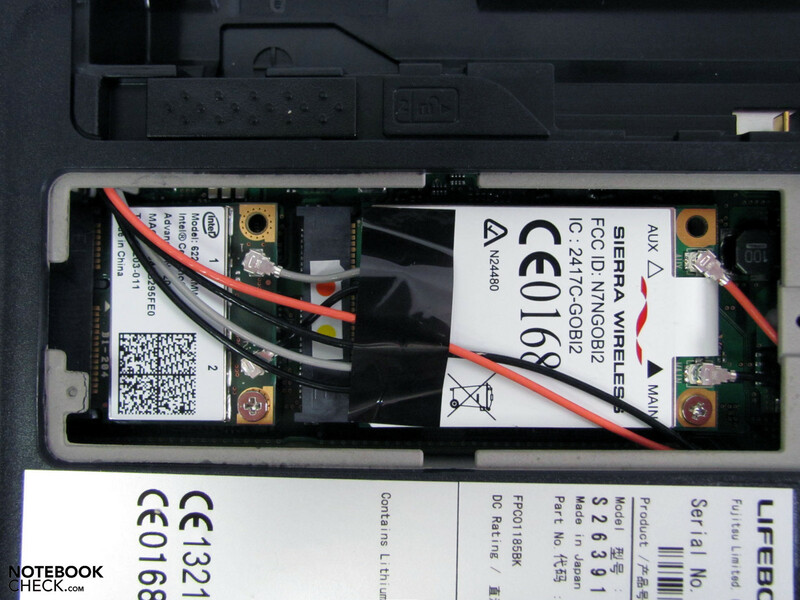 The fingerprint reader in the display bezel is one of many business features. The display hinge is only partly satisfactory. It tends to let the display fall back. Separate tablet buttons in the bulge simplify use. Even the bottom is solid and easy to clean. 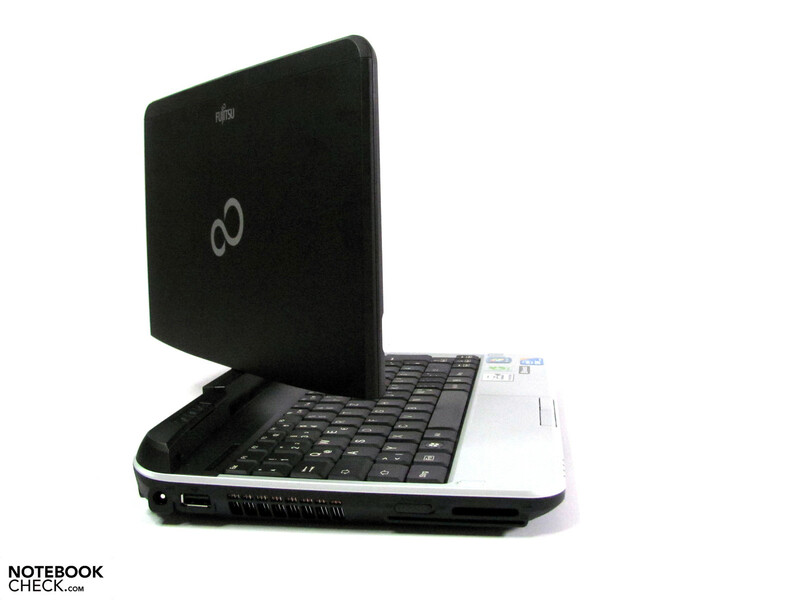 Very compact convertible notebook with business appropriate equipment and solid case. 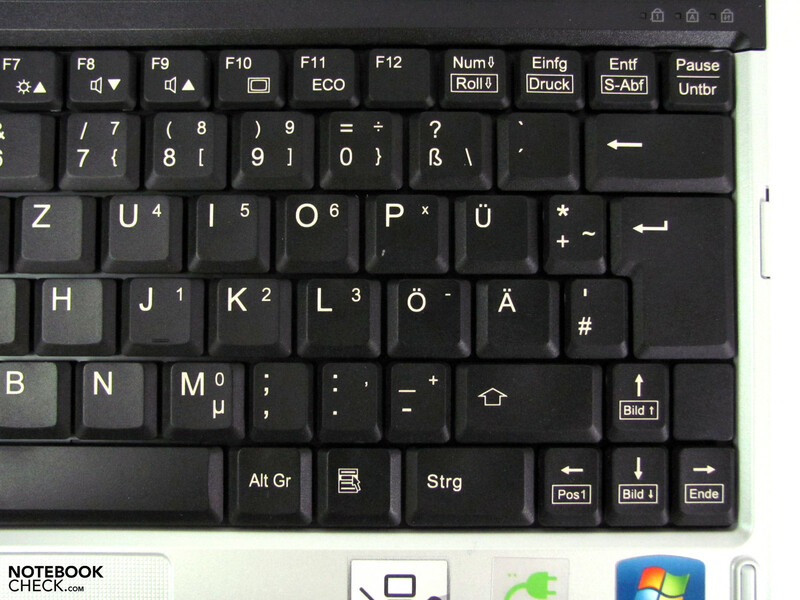 Pen and finger inputting are well-implemented, but suffer a bit due to the operating system. A high contrast and anti-reflective display, a port for fast peripherals and in particular, a stronger pivot hinge for the display. The high power consumption despite modest economic components.